SAN FRANCISCO — California should consider adjusting a system that pins transportation infrastructure to the sale of gasoline and diesel. That’s the conclusion of a new white paper published by a nonprofit, nonpartisan think tank. 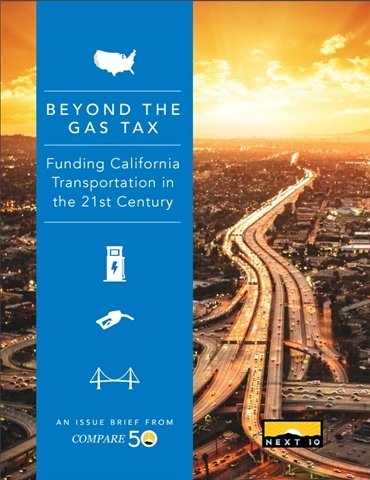 The white paper, “Beyond the Gas Tax: Funding Transportation in the 21st Century,” was delivered just after the passage of Senate Bill 1, a transportation funding bill that raises the state’s gasoline tax by 12 cents a gallon. The white paper, commissioned by Next 10 and prepared by Beacon Economics, says the amount of tax revenue collected under the legislation isn’t enough to complete the backlog of repairs to fix California’s roads. The white paper points out that that while California roads are among the worst in the nation, funding for repairs and improvements — which comes largely from motor vehicle fuel taxes — is declining as cars become more fuel efficient and the state’s electric vehicle fleet grows. It calls on the state to develop a new model for transportation funding in order to address infrastructure needs. Senate Bill 1 is expected to bring in $52.4 billion in revenue over a 10-year period. That figure falls short of the current $137 billion deferred maintenance deficit that has not been addressed. And the deficit may continue to grow, the white paper states, as inflation-adjusted fuel tax revenue declined 20% from 2010 to 2015 despite Californians logging a record 335 billion miles traveled in 2015. According to the white paper, low fuel prices and vehicles with improved fuel economy are responsible for declines in fuel taxes. New vehicles, for instance, have improved fuel efficiency by more than 27% in a decade, with vehicles traveling an average of five and half miles farther on every gallon of gas. Additionally, approximately 258,000 electric vehicles have been sold in the state so far. And if California succeeds in putting 1.5 million zero-emission vehicles on the road by 2015, the white paper states, the displacement of gasoline would mean a revenue loss of $572 million in state gasoline taxes and $276 million federal excise taxes. Most California roads are at least 40 years old, and have reached or exceeded their designed useful life. Bad roads come with a cost: the American Society of Civil Engineers’ 2017 Infrastructure Report Card estimates that driving on poorly maintained roads costs each California motorist $844 in vehicle repairs per year. That’s the nation’s second-highest cost per driver, trailing only Connecticut. While SB 1 provides some important steps forward, such as tying new excise tax rates to inflation, the legislation does not account for user-specific costs, which will be key in ensuring sustainable funding in an evolving vehicle marketplace. Tying taxes and fees to usage will help provide more reliable revenue as cars and trucks improve efficiency and the electric vehicle market grows. California is exploring a mileage-based user tax, which charges the most to drivers who use the roads the most. The white paper discusses privacy, tracking concerns, and public trust issues, as well as questions about equity and efficiency. Another solution is to fund toll roads through public/private partnerships. This could save taxpayers money, and ensure that the people who pay for a given road are the people who actually use that road. The risk is that private companies may pursue more low-risk, profit-driven projects that might not align with the infrastructure needs of the state or the transportation needs of its residents.